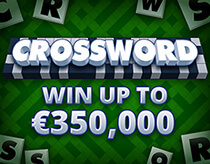 Kick back and relax with Crossword Cash! Complete words to win prizes; the more words you complete, the more you win! Win with words in this timeless classic! Match your 18 letters to the letters in the grid and complete words to win! You have 18 "YOUR LETTERS" to reveal. Each letter you reveal in "YOUR LETTERS" will mark off all matching letters in the game board. As letters are marked off, words in the game board will be completed. Any words that have every letter marked off will be counted as a completed word. Once all 18 "YOUR LETTERS" have been revealed and all matching letters on the game board have been marked off, if the required number of completed words have been made then the corresponding row on the prize table will be filled. Pressing "REVEAL ALL" will rapidly reveal all 18 "YOUR LETTERS". Completing three or more words on the game board.